We can make tires to fit chaise lounges and tea carts. The #30-910 6" x 1-1/4" Wheel White Plastic Hub and Black Rubber Tire is the only tire made of rubber. All other tires and tire extrusions are made from recycled vinyl. Vinyl tires will not leave black marks on patio floors like black rubber tires. We stock three extrusions. The tire size is determined by measuring the diameter of the rim. Tires are made slightly smaller than the radius of the rim. They are heated and stretched over the rim. We have tires that fit a grooved or flat rim. 7" Rim Diameter with a	3/4" width vinyl tire. The overall combined diameter of the tire on the rim would be 8 1/2"
The rim is not painted and the center hole is not drilled where the axle goes. You will need to drill the hole depending on the diameter of your axel. After you paint the hub, you heat the tire in near boiling water and stretch it over the hub. Small Grooved Rim Tire extrusion is made of black vinyl. It can be cut, spliced, heated and stretched to fit metal grooved tire rims. Vinyl tires will not leave black marks on patio floors like black rubber tires. Tires are ordered by rim diameter. They will be slightly smaller. The tire is heated and stretched over the rim and into a grooved rim. Custom sizes also available (minimum 25 tires). 3/4" Flat Rim Tire extrusion is made of black vinyl. It can be cut, spliced, heated and stretched to fit flat metal tire rims. Vinyl tires will not leave black marks on patio floors like black rubber tires. Tires are ordered by rim diameter. They will be slightly smaller. The tire is heated and stretched over a flat rim. 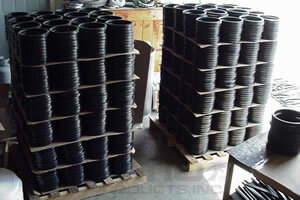 Large Grooved Rim Tire extrusion is made of black vinyl. It can be cut, spliced, heated and stretched to fit metal grooved tire rims. Vinyl tires will not leave black marks on patio floors like black rubber tires.